Oh, yes, we can can! Pacific City, Oregon (March 27, 2019)—The PeliCANs are landing just in time for Spring refreshment! 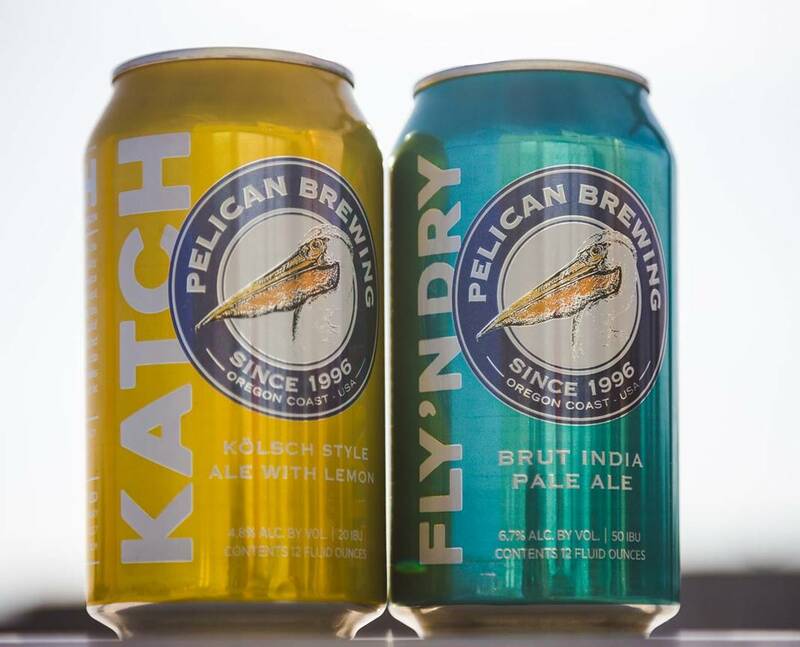 Pelican Brewing Company introduces two new beers to its year-round lineup—and both in a canned format perfect for active lifestyles and environmentally-conscious consumers. Welcome Fly’N Dry Brut India Pale Ale and Katch Kölsch-style Ale with Lemon. Both beers are available in 12 oz. cans in eco-friendly cardboard 6-pack carriers. The newest Pelican conceptions join Hazy Rock Juicy IPA—the first of the Pelican canned beer series which hit the market last summer and remains a year-round offering. The new additions are expected to land in the craft beer aisle early April. Fly’N Dry reimagines and amplifies what an IPA can be: fruity, hoppy and well-attenuated, with a dry, yet refreshing finish. Starting with a clean malt base, Fly’N Dry brings heaps of exotic Hüll Melon hops and punchy Citra hops to amplify the flavor party. Hints of candied orange, white grape, melon, rose and citrus combine in a range of bright hop-driven aromatics. A refreshingly dry finish counterpoints the sparkling effervescence and brings brilliant clarity to the tasting experience. Fly’N Dry is the next evolution of the IPA, so prepare your taste buds! Two-row malt, Dextrapils malt, flaked barley, Hüll Melon hops, Citra hops, Magnum hops, pure coastal water, pure ale yeast combine for a bright punchy aroma of orange, melon and white grape and a sparkling carbonation with a crisp, snappy, dry finish. Katch Kölsch introduces a fun twist on the classic German-style beer. If you’re lucky enough to reel in this brew you’ll experience the fresh, zesty aroma of lemon peel and tangerine-like Mandarina hops, making this Katch bright and refreshing. A background of toasty malt anchors the balance, highlighted with refreshing citrus flavors. A lean, crisp mouthfeel with a soft, clean finish makes Katch Kölsch eminently crushable. Don’t let this one get away—Katch it if you can! Pilsner malt, Dextrapils malt, Mandarina Bavaria hops, lemon peel, pure local water, pure ale yeast blend for a fresh, zesty aroma, subtle toasty malt character and lean, crisp mouthfeel. Welch continues to be one of the most decorated brewers in the Pacific Northwest, earning well over 450 medals including several Gold last year alone at the World Beer Cup, Australian International Beer Awards and North American Beer Awards. 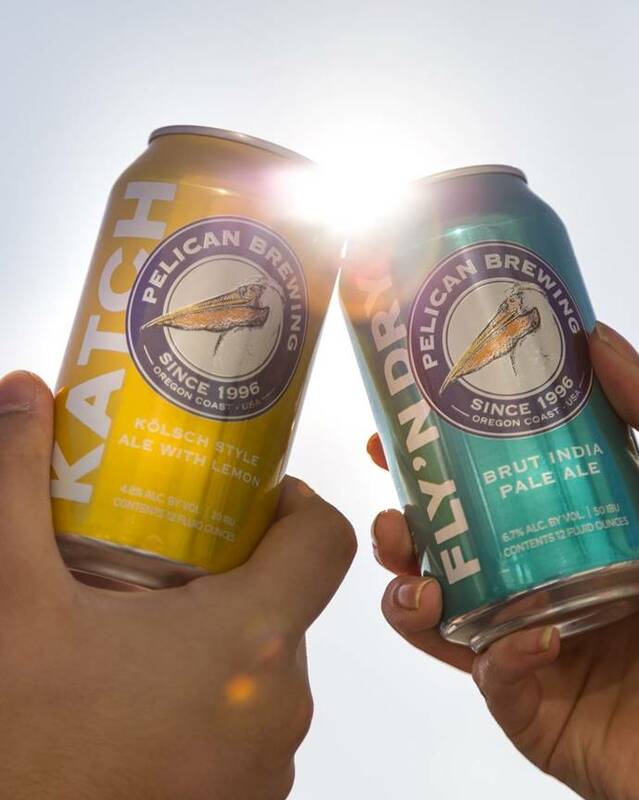 Like all Pelican beers, Fly’N Dry and Katch are born at the beach by a team of award-winning craft beer makers known for brewing styles of beer that they themselves love to drink. Cheers! Pelican Brewing Company was founded in 1996 by Jeff Schons and Mary Jones in Pacific City with Oregon’s only oceanfront brewpub. Celebrating its 24th year, the brewing company has created masterpieces like Kiwanda Cream Ale, Beak Breaker Double IPA, Sea ‘N Red Irish-Style Red Ale, Five Fin West Coast Pilsner, and Tsunami Stout. With the vision, creativity and brewing expertise of founding brewmaster Darron Welch, Pelican Brewing has won over 450 awards including a Silver Medal at the 2016 Great American Beer Festival, 2014 World Beer Cup© Champion Small Brewing Company and Brewmaster of the Year. 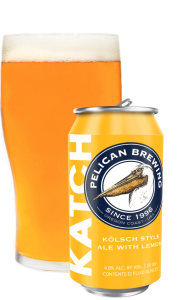 Pelican Brewing currently distributes 22oz bottles, 12oz bottles in 6-packs, a new mixed 12-pack, and 50 liter and 20-liter kegs via a network of distributors in Oregon, Washington, Idaho, Utah, and Hawaii. The company operates brewing and brewpub facilities in Pacific City, Tillamook and Cannon Beach.